They were meant to be the next Beatles but a series of tragedies, mismanagement and “rock and roll rip-offs” left Badfinger a sad footnote in musical history. Badfinger had four consecutive worldwide hits from 1970 to 1972: "Come and Get It" (written and produced by Paul McCartney, "No Matter What", "Day After Day" (produced by George Harrison, and "Baby Blue". The future looked bright, "Come and Get It" released in December 1969 in the UK, and January 1970 in the US sold over a million copies worldwide, reaching the Top Ten throughout the world: No.7 on the US chart and No.4 in the UK. But the future for Badfinger was set to decline, with line up changes and legal battles that would haunt the band and it’s members forever. They were supposed to be the next Beatles but a series of tragedies, mismanagement and “rock and roll rip-offs” left Badfinger little more than a sad footnote in musical history. The Iveys formed in 1961 in Swansea, Wales from The Panthers and in March 1965, drummer Gibbins joined The Iveys. The group secured gigs around the Swansea area, opening for prominent British groups such as the Spencer Davis Group, The Who, The Moody Blues and The Yardbirds. In August 1967, Liverpudlian guitarist Tom Evans, of Them Calderstones joined the ranks and the following year Beatles' roadie/assistant Mal Evans and Apple Records' A&R head Peter Asher saw them perform at the Marquee Club, London. Afterwards, Evans consistently pushed their demo tapes to every Beatle until he gained approval from all four to sign the group to their Apple label. Paul McCartney offered the song "Come And Get It" to the group, although he had written the song for the soundtrack of The Magic Christian. Producing the track in less than one hour, McCartney made sure that they copied his own demo note-for-note. In October 1969, pending the release of "Come and Get It", the band and Apple agreed upon a name change, as The Iveys were sometimes confused with "The Ivy League". Suggestions were put forward, like John Lennon's "The Glass Onion", "The Prix", "The Cagneys", and "Home" from McCartney. 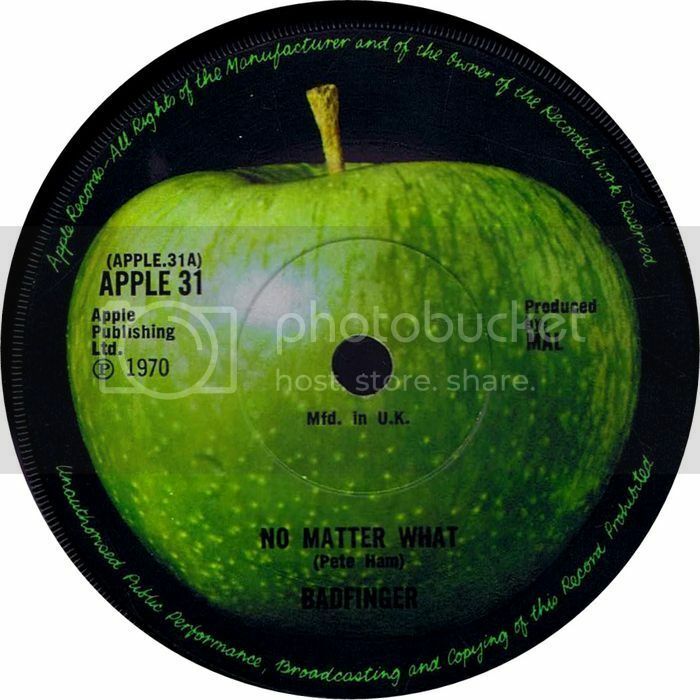 Apple Corps' Neil Aspinall proposed "Badfinger", in reference to "Bad Finger Boogie"; an early working title of Lennon–McCartney's "With a Little Help from My Friends", as Lennon had hurt his forefinger on a piano and was using only one finger. Around this time they hired guitarist Joey Molland, who was previously with Gary Walker & The Rain, The Masterminds, and The Fruit-Eating Bears, with his addition requiring Evans to shift to bass. A string of memorable hit singles followed after the success of "Come and Get It," - "No Matter What," "Day After Day," and "Baby Blue" but the band saw almost no reward from that success. Instead, four years of hit singles and international tours precipitated the suicides of its two creative members and legal proceedings that left lawyers as the only ones enriched by the group's work. 1974 was, for the band, the culmination of a series of events that would keep lawyers and accountants busy for years. The individual group members found themselves impoverished and in debt despite their years of work, and with little prospect of seeing any of their money at any time soon. A third album, entitled Head First, (on Warners), was hastily recorded by the group late in 1974 but was never released. The group's affairs, already a shambles, had turned into a nightmare. On April 23, 1975, a year into these financial and professional crises, Ham who was critically short of money, with no prospect of seeing any that was owed to him, hanged himself in his garage. Ham was aged 27 at the time; his suicide fell just three days shy of his 28th birthday. He left behind a pregnant girlfriend, who gave birth to their daughter one month after his death. His suicide note had the statement, "I will not be allowed to love and trust everybody. This is better." After Ham's death, Badfinger dissolved. By 1977, both Joey Molland and Tom Evans were out of the music business and were flat broke, During 1982 and 1983, Molland and Evans operated rival touring bands, each using the name Badfinger, which created personal and professional conflict. During the evening of 18 November 1983, Tom Evans argued with Joey Molland of Badfinger on the telephone, chiefly regarding potential publishing monies. Early the following morning, on 19 November, Evans was found dead by suicide, his body hanging in his back garden from a willow tree. In 1994, the year in which Mariah Carey covered the song "Without You", the royalties for Ham's estate received over $500,000, and the song has since been recorded by over 180 artists. In April 2013 a blue plaque was unveiled to honour Pete Ham in his hometown of Swansea.